Usually ships within 1-2 business days if in stock. Please let us know your graduation date. I understand that if I personalize this item I must approve the design proof at least 2 weeks prior to my graduation date. 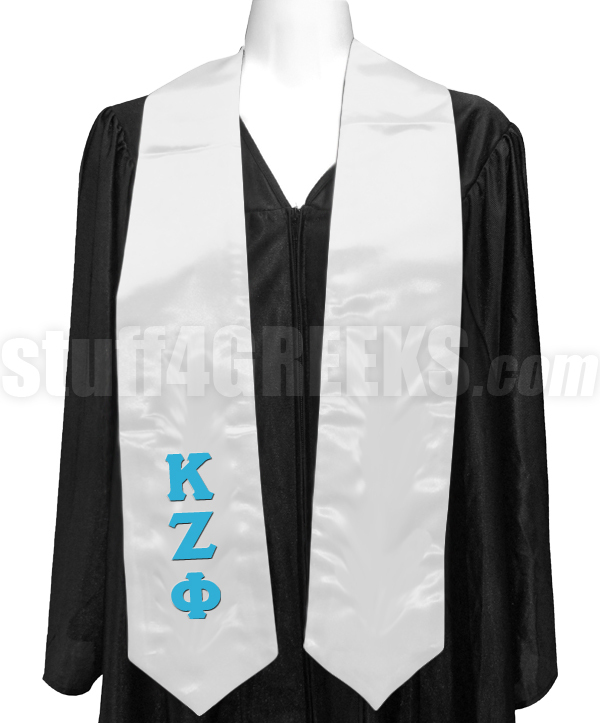 White Kappa Zeta Phi satin graduation stole with the Greek letters down the right panel. Don't want this exact color setup? No problem, we can customize it any way you want. Click here to order a custom Greek satin graduation stole just the way you want it. You will earn at least 60 rewards points for this purchase. Your total rewards points will be higher based on the options and quantities that you choose. Your merchandise total at checkout is your true rewards value. We will try to accomodate your graduation date, but rush fees may apply. Please call for availability.